This page describes the structure fluid lipid bilayer membranes determined by means of X-ray and neutron diffraction methods developed in our laboratory. It also describes recent results from the use of these methods for determining the disposition of helical peptides in fluid bilayers. This molecular dynamics simulation of a dioleoyl-phosphatidylcholine (DOPC) bilayer in excess water demonstrates the extreme thermal motion of fluid lipid bilayers. The high disorder precludes the use of structure determination by standard crystallographic methods. The need for quantitatively useful structural information for fluid bilayer systems such as this stimulated the development of the methods described below. In this movie, the molecular component groups of DOPC are color coded according to the chart on the right. These groups correspond to those whose time-averaged transbilayer distributions have been determined by the combined use of x-ray and neutron diffraction measurements. A large (251MB, 768x576 pixel) version of this Quicktime movie, suitable for presentation, is available for download here. Determining the Structure of Fluid Lipid Bilayers. A molecular understanding of the interaction of peptides and proteins with lipid bilayers requires experimental knowledge of the structure of the membrane bilayer, the transbilayer location of bound peptides, the structures the peptides adopt, and the changes that occur in the bilayer structure as a result of partitioning. Because cellular membranes must be in a fluid state for normal cell function, it is the structure of fluid (Lα-phase) bilayers that is relevant to understanding the interactions of peptides in molecular detail. Unfortunately, the high thermal disorder of fluid bilayers precludes atomic-resolution three-dimensional crystallographic images. Useful structural information can nevertheless be obtained by diffraction methods because multilamellar bilayers (liquid crystals) obtained from phospholipids by dispersal in water or by deposition on surfaces are highly periodic along the bilayer normal. This one-dimensional crystallinity allows the distribution of matter along the bilayer normal to be determined from combined x-ray and neutron diffraction measurements [liquid-crystallography; reviewed in White & Wiener (1, 2)]. 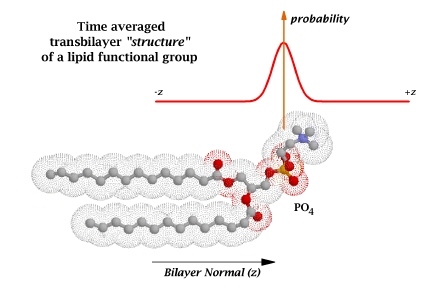 The 'structure' of a fluid bilayer is consequently defined operationally as the time-averaged spatial distributions of the principal structural (quasi-molecular) groups of the lipid (carbonyls, phosphates, etc.) projected onto an axis normal to the bilayer plane (3), as shown in Figure 1 for the phosphate group of a phosphatidylycholine molecule. Such distributions are equivalent to probability densities from which the probability of finding a particular structural group at a specific location can be determined. Complete structural images of this sort which account for all of the constituents of the unit cell can be obtained using a joint refinement procedure developed in this laboratory that allows one to combine x-ray and neutron data to arrive at fully-resolved images of fluid bilayers (3, 4, 5, 6, 7, 8). A representation of the liquid-crystallographic structure of an Lα-phase dioleoylphosphatidylcholine (DOPC) bilayer (8) is shown in Figure 2A. The time-averaged transbilayer distributions of the quasi-molecular groups shown can be thought of as probability or number densities, as discussed above. That is, they give the probability of finding a particular structural group at a specific location in the bilayer or the number of groups per unit volume at a given location. The areas under the peaks are equal to the number of structural groups per lipid molecule (e.g. two methyls, 28 methylenes, one phosphate). The peaks are determined in the liquid-crystallographic experiment with high precision (0.02-0.5 Å), represent fully resolved images, and are accurate representations of the true thermal motion of the molecules. This thermal motion is a fundamental and important feature of fluid bilayers that plays a critical role in peptide-bilayer interactions. Although the structural image of Figure 2A was obtained at low hydration, 5.4 waters per lipid, recent work in our laboratory demonstrates that the overall structure changes in only subtle ways as the water content is increased (9). Several features of the fluid DOPC structure are important. First, the great amount of thermal disorder is revealed by the widths of the probability densities. Second, the combined thermal thickness of the interfacial regions (defined by the distribution of the waters of hydration) is about equal to the 30 Å thickness of the HC core. The thermal thickness of a single interface (15 Å) can easily accommodate unfolded and folded polypeptide chains, as illustrated schematically by the end-on representation of an α-helix with diameter ~10 Å (typical of helices in membrane proteins). In this light, the common cartoons of bilayers that assign a diminutive thickness to the bilayer headgroup/interface region can be seen as misleading. Third, the interfaces are chemically highly heterogeneous; they are rich in possibilities for non-covalent interactions with peptides. Because the interfaces are the sites of first contact, they are especially important in the folding and insertion of non-constitutive membrane proteins such as toxins. But, they are also important for the folding and stability of constitutive membrane proteins because significant portions of their mass contact the interfaces. Besides being chemically heterogeneous, the interfaces are, not surprisingly, regions in which dramatic changes in polarity occur over small distances. To illustrate this point, shown in Figure 2B is the "polarity profile" of a DOPC bilayer derived from the structural image of Figure 2A by White and Wimley (10). This profile was calculated from the quasi-molecular-group volumes of Wiener & White (8) and the partial charges of the groups using the atomic partial charges of phospholipids reported by Charifson et al. (11). It represents the average density of atomic partial charges, both + and −, calculated by weighting the absolute values of the charge densities by the number density and group volume at each position across the bilayer. The very steep gradient of polarity in the interfaces is consistent with calculated interfacial electrostatic free energy profiles of charged membranes recently reviewed by Murray et al. (12; see their Fig. 2). X-ray diffraction measurements on DOPC multilayers containing the ideally amphipathic 18-residue alpha-helical peptide 18A (13) have permitted us to determine the precise location of the helix within the bilayer, as shown in Figure 3 (14). Just as for the principal structural groups of the lipid, the thermal motion of the bilayer and the helix cause the transbilayer profile of the helix to be Gaussian. The axis of the 18A helix, which is parallel to the membrane surface, is located between the mean positions of the glycerol and carbonyl groups. (If the hydrocarbon core were a simple bulk slab of oleoyl chains, the peak of the carbonyl group would define the surface of the slab. See (8).) The surface of the helix penetrates to about the level of the double-bonds without causing major perturbations in the structure of the bilayer. 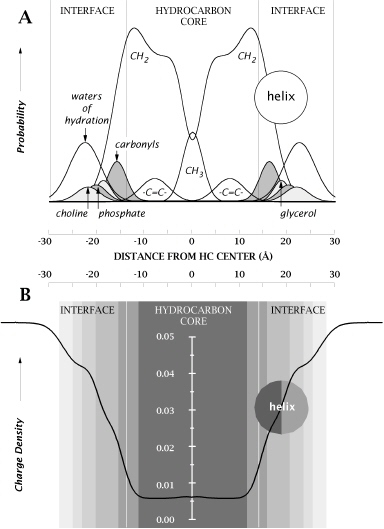 In terms of the polarity profile shown in Figure 2B, the 18A amphipathic helix resides at approximately the mid-point of the steep decent of polarity that arises as the headgroup region gives way to the hydrocarbon region. This illustrated in 2B by the shaded circle representing the cross-section of 18A. LIPIDAT.2 relational database of thermodynamic and associated information on lipid mesophase and crystal polymorphic transitions. There are 20,784 records in the database. The database includes lipid molecular structures. Lipid Bilayers and the Gramicidin Channel This site has lots of lipid molecules and bilayers that can be viewed with the Java applet Jmol. It is provided by Angel Herráez at the Universidad de Alcalá. Molecular Dynamics Simulations of Lipid Bilayers from the Scott Feller Laboratory at Wabash College. This site provides, among other things, PDB coördinates of lipid bilayers produced by molecular dynamics simulations. Included are simulations of DOPC bilayers at low hydration whose experimental structure is described on this page. Molecular Dynamics Simulations of POPC in various phases by Helmut Heller of the Leibniz-Rechenzentrum in Munich. Lipid Bilayer Membranes for RasMol. PDB files are available for 1-palmitoyl 2-oleoyl phosphatidyl choline bilayers (200 molecules total), hydrated with about 15 layers of water on each side, for various configurations. White SH. & Wiener MC (1995). Determination of the structure of fluid lipid bilayer membranes. In Permeability and Stability of Lipid Bilayers (E.A. Disalvo & S.A. Simon, eds ), pp. 1-19, CRC Press, Boca Raton. White SH & Wiener MC (1996). The liquid-crystallographic structure of fluid lipid bilayer membranes. In Membrane Structure and Dynamics (K.M. Merz & B. Roux, eds), pp. 127-144, Birkhäuser, Boston. Wiener MC & White SH (1991). Biophys. J. 59:162-173. Wiener MC & White SH (1991). Biophys. J. 59:174-185. Wiener MC & White SH (1991). Biochemistry 30:6997-7008. Wiener MC, King GI & White SH (1991). Biophys. J. 60:568-576. Wiener MC & White SH (1992). Biophys. J. 61:428-433. Wiener MC & White SH (1992). Biophys. J. 61:434-447. Hristova K & White SH (1998). Biophys. J. 74:2419-2433. White SH & Wimley WC (1998). BBA-Reviews on Biomembranes. Biochim. Biophys. Acta 1376:339-352. Charifson, P. S., Hiskey, R. G. & Pedersen, L. G. (1997). Construction and molecular modeling of phospholipid surfaces. J. Comput. Chem. 11, 1181-1186. Murray D, Ben-Tal N, Honig B & McLaughlin S (1997). Structure 5:985-989. Mishra VK, Palgunachari MN, Segrest JP & Anantharamaiah GM (1994). J. Biol. Chem. 269:7185-7191. Hristova, K., Wimley, W. C., Mishra, V. K., Anantharamiah, G. M., Segrest, J. P., and White S. H. (1999). J. Mol. Biol. 290:99-117.